Mozilla has finally listened to those who've been complaining about the fast release cycle of Firefox, introduced a while back. Some of them were just annoyed by the updates hitting them almost every month, while others deploying Firefox in controlled environments, such as enterprises or public institutions, had solid reasons to condemn the fast release cycle. There were also others who were bugged by Firefox breaking their add-ons with every new release (however, the most part of this problem has already been addressed, in a way that Firefox now considers all add-ons being compatible by default). 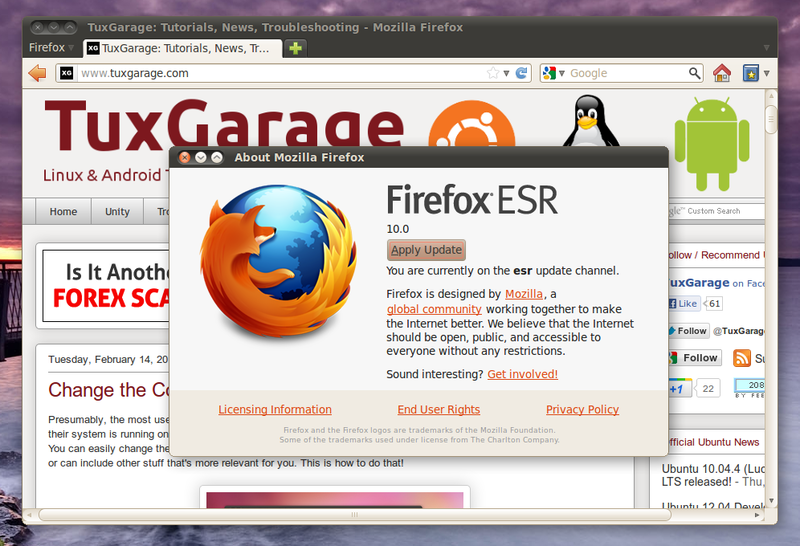 For all those, Mozilla is now offering an ESR version of Firefox, alongside to the regular version. Chris Coulson, maintainer of the Firefox packages for Ubuntu, has recently outlined on his blog the pros and cons, and the prospects of offering the Firefox ESR version via the official repos or a PPA for easy installation in Ubuntu - the bottom line: as of now, not planned via the official repos; but maybe via a PPA. But, while we're waiting for what will happen on this front, you can manually download and install Firefox ESR on any Linux, and can easily keep it updated from within Firefox itself. Note: In the comments, Mike_tn has mentioned that Debian Iceweasel ESR could be installed in Ubuntu also. And as that would be a package and repo-based installation, it would be much easier, of course. But as of now, that doesn't work, because of a missing dependency - it's expecting 'xulrunner' with a version number equal to the ESR version, '10.0' as of now. Now you can simply click your existing Firefox shortcuts for launching Firefox ESR. 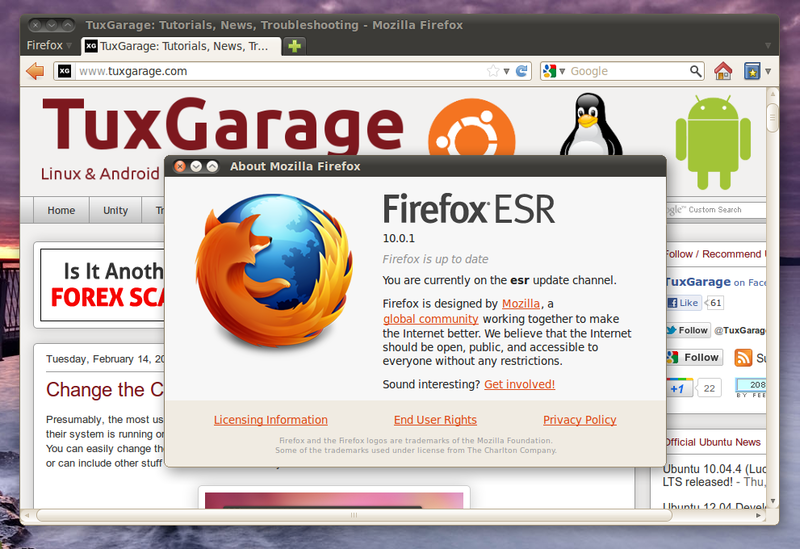 This will launch Firefox ESR with root privileges. From Firefox, go to 'Help > About Firefox' and see if any updates are available. By default, Firefox downloads any available updates automatically, in that case you only need to click on 'Apply Updates', otherwise you'd need to click on 'Check for Updates' before. In either case, after clicking 'Apply Updates' confirm the restart of Firefox, still with root privileges, so that Firefox is able to actually apply the updates! Once the updates have been applied, close all Firefox windows and (re)start it normally, as your own user.